This is “Business Buying Behavior”, chapter 4 from the book Marketing Principles (v. 1.0). For details on it (including licensing), click here. In the last chapter, we talked about the buying behavior of consumers—people like you and me who buy products for our own personal use. However, many businesses don’t offer their goods and services to individual consumers at all. Instead, their customers are other businesses, institutions, or government organizations. These are the business-to-business (B2B) markets we talked about in Chapter 1 "What Is Marketing?". Business-to-business (B2B) markets differ from business-to-consumer (B2C) markets in many ways. For one, the number of products sold in business markets dwarfs the number sold in consumer markets. Suppose you buy a five-hundred-dollar computer from Dell. The sale amounts to a single transaction for you. But think of all the transactions Dell had to go through to sell you that one computer. Dell had to purchase many parts from many computer component makers. It also had to purchase equipment and facilities to assemble the computers, hire and pay employees, pay money to create and maintain its Web site and advertise, and buy insurance and accounting and financial services to keep its operations running smoothly. Many transactions had to happen before yours could. Business products can also be very complex. Some need to be custom built or retrofitted for buyers. The products include everything from high-dollar construction equipment to commercial real estate and buildings, military equipment, and billion-dollar cruise liners used in the tourism industry. There are few or no individual consumers in the market for many of these products. Moreover, a single customer can account for a huge amount of business. Some businesses, like those that supply the U.S. auto industry around Detroit, have just a handful of customers—General Motors, Chrysler, and/or Ford. Consequently, you can imagine why these suppliers become very worried when the automakers fall on hard times. Not only can business products be complex, but so can figuring out the buying dynamics of organizations. Many people within an organization can be part of the buying process and have a say in ultimately what gets purchased, how much of it, and from whom. This is perhaps the most complicated part of the business. In fact, it’s a bit like a chess match. And because of the quantities each business customer is capable of buying, the stakes are high. For some organizations, losing a big account can be financially devastating and winning one can be a financial bonanza. How high are the stakes? Table 4.1 "Top Five Corporations Worldwide in Terms of Their Revenues" shows a recent ranking of the top five corporations in the world in terms of the sales they generate annually. Believe it or not, these companies earn more in a year than all the businesses of some countries do. Imagine the windfall you could gain as a seller by landing an exclusive account with any one of them. Generally, the more high-dollar and complex the item being sold is, the longer it takes for the sale to be made. The sale of a new commercial jet to an airline company such as U.S. Airways, Delta, or American Airlines can take literally years to be completed. Sales such as these are risky for companies. The buyers are concerned about many factors, such as the safety, reliability, and efficiency of the planes. They also generally want the jets customized in some way. Consequently, a lot of time and effort is needed to close these deals. Unlike many consumers, most business buyers demand that the products they buy meet strict standards. Take, for example, the Five Guys burger chain, based in Virginia. The company taste-tested eighteen different types of mayonnaise before settling on the one it uses. Would you be willing to taste eighteen different brands of mayonnaise before buying one? Probably not.Michael Steinberg, “A Fine Diner,” Financial Times, November 21–22, 2009, 5. Another characteristic of B2B markets is the level of personal selling that goes on. Salespeople personally call on business customers to a far greater extent than they do consumers. 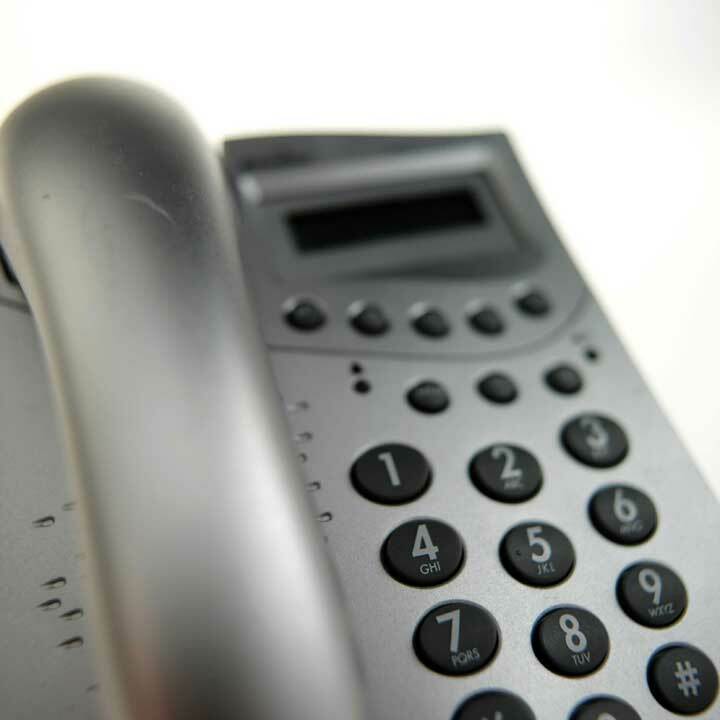 Most of us have had door-to-door salespeople call on us occasionally. However, businesses often have multiple salespeople call on them in person daily, and some customers even provide office space for key vendors’ salespeople. Table 4.2 "Business-to-Consumer Markets versus Business-to-Business Markets: How They Compare" outlines the main differences between B2C and B2B markets. Even though they don’t sell their products to consumers like you and me, B2B sellers carefully watch general economic conditions to anticipate consumer buying patterns. The firms do so because the demand for business products is based on derived demand. Derived demandDemand that springs from, or is derived from, a secondary source other than the primary buyer of the product. is demand that springs from, or is derived from, a source other than the primary buyer of a product. When it comes to B2B sales, that source is consumers. If consumers aren’t demanding the products produced by businesses, the firms that supply products to these businesses are in big trouble. Fluctuating demandDemand that fluctuates sharply in response to a change in consumer demand. is another characteristic of B2B markets: a small change in demand by consumers can have a big effect throughout the chain of businesses that supply all the goods and services that produce it. Often, a bullwhip type of effect occurs. If you have ever held a whip, you know that a slight shake of the handle will result in a big snap of the whip at its tip. Essentially, consumers are the handle and businesses along the chain compose the whip—hence the need to keep tabs on end consumers. They are a powerful purchasing force. For example, Cisco makes routers, which are specialized computers that enable computer networks to work. If Google uses five hundred routers and replaces 10 percent of them each year, that means Google usually buys fifty routers in a given year. What happens if consumer demand for the Internet falls by 10 percent? Then Google needs only 450 routers. Google’s demand for Cisco’s routers therefore becomes zero. Suppose the following year the demand for the Internet returns to normal. Google now needs to replace the fifty routers it didn’t buy in the first year plus the fifty it needs to replace in the second year. So in year two, Cisco’s sales go from zero to a hundred, or twice normal. Thus, Cisco experiences a bullwhip effect, whereas Google’s sales vary only by 10 percent. Because consumers are such a powerful force, some companies go so far as to try to influence their B2B sales by directly influencing consumers even though they don’t sell their products to them. Intel is a classic case. Do you really care what sort of microprocessing chip gets built into your computer? Intel would like you to, which is why it runs TV commercials like the Homer Simpson commercial shown in the video clip below. The commercial isn’t likely to persuade a computer manufacturer to buy Intel’s chips. But the manufacturer might be persuaded to buy them if it’s important to you. Derived demand is also the reason Intel demands that the buyers of its chips put a little “Intel Inside” sticker on each computer they make—so you get to know Intel and demand its products. B2B buyers also keep tabs on consumers to look for patterns that could create joint demand. Joint demandWhen the demand for one product increases the demand for another. occurs when the demand for one product increases the demand for another. For example, when a new video console like the Xbox comes out, it creates demand for a whole new crop of video games. Describe the major categories of business buyers. Explain why finding decision makers in business markets is challenging for sellers. Business buyers can be either nonprofit or for-profit businesses. To help you get a better idea of the different types of business customers in B2B markets, we’ve put them into four basic categories: producers, resellers, governments, and institutions. Your local tattoo parlor is a producer. ProducersCompanies that purchase goods and services that they transform into other products. are companies that purchase goods and services that they transform into other products. They include both manufacturers and service providers. Procter & Gamble, General Motors, McDonald’s, Dell, and Delta Airlines are examples. So are the restaurants around your campus, your dentist, your doctor, and the local tattoo parlor. All these businesses have to buy certain products to produce the goods and services they create. General Motors needs steel and hundreds of thousands of other products to produce cars. McDonald’s needs beef and potatoes. Delta Airlines needs fuel and planes. Your dentist needs drugs such as Novocain, oral tools, and X-ray machinery. Your local tattoo parlor needs special inks and needles and a bright neon sign that flashes “open” in the middle of the night. ResellersCompanies that sell goods and services produced by other firms without materially changing them. are companies that sell goods and services produced by other firms without materially changing them. They include wholesalers, brokers, and retailers. Walmart and Target are two big retailers you are familiar with. Large wholesalers, brokers, and retailers have a great deal of market power. If you can get them to buy your products, your sales can exponentially increase. Every day, retailers flock to Walmart’s corporate headquarters in Bentonville, Arkansas, to try to hawk their products. But would it surprise you that not everybody wants to do business with a powerhouse like Walmart? Jim Wier, one-time CEO of the company that produces Snapper-brand mowers and snow blowers, actually took a trip to Walmart’s headquarters to stop doing business with the company. Why? Snapper products are high-end, heavy-duty products. Wier knew that Walmart had been selling his company’s products for lower and lower prices and wanted deeper and deeper discounts from Snapper. He believed Snapper products were too expensive for Walmart’s customers and always would be, unless the company started making cheaper-quality products or outsourced their manufacturing overseas, which is something he didn’t want to do. “The whole visit to Wal-Mart’s headquarters is a great experience,” said Wier about his trip. “It’s so crowded, you have to drive around, waiting for a parking space. You have to follow someone who is leaving, walking back to their car, and get their spot. Then you go inside this building, you register for your appointment, they give you a badge, and then you wait in the pews with the rest of the peddlers, the guy with the bras draped over his shoulder.” Eventually, would-be suppliers were taken into small cubicles where they had thirty minutes to make their case. “It’s a little like going to see the principal, really,” he said.Charles Fishman, “The Man Who Said No to Wal-Mart,” Fast Company, December 19, 2007, http://www.fastcompany.com/magazine/102/open_snapper.html?page=0%2C2 (accessed December 13, 2009). Can you guess the biggest purchaser of goods and services in the world? It is the U.S. government. It purchases everything you can imagine, from paper and fax machines to tanks and weapons, buildings, toilets for NASA (the National Aeronautics and Space Administration), highway construction services, and medical and security services. State and local governments buy enormous amounts of products, too. They contract with companies that provide citizens with all kinds of services from transportation to garbage collection. (So do foreign governments, provinces, and localities, of course.) Business-to-government (B2G) marketsMarkets in which local, state, and federal governments buy products., or when companies sell to local, state, and federal governments, represent a major selling opportunity, even for smaller sellers. In fact, many government entities specify that their agencies must award a certain amount of business to small businesses, minority- and women-owned businesses, and businesses owned by disabled veterans. There is no one central department or place in which all these products are bought and sold. Companies that want to sell to the U.S. government should first register with the Central Contractor Registry at http://www.CCR.gov. They should then consult the General Services Administration (GSA) Web site (http://www.gsa.gov). The GSA helps more than two hundred federal agencies buy a wide variety of products purchased routinely. The products can include office supplies, information technology services, repair services, vehicles, and many other products purchased by agencies on a regular basis. Consequently, it is a good starting point. However, the GSA won’t negotiate a contract for the NASA toilet or a fighter jet. It sticks to routine types of purchases. The General Services Administration (GSA) is a good starting point for companies that want to do business with the federal government. 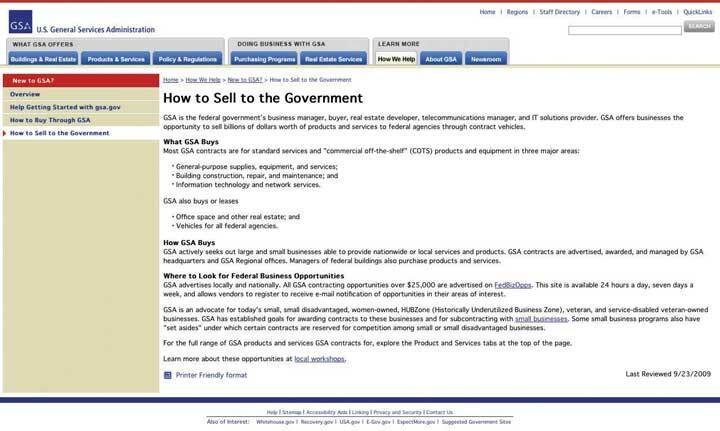 The U.S. Small Business Administration (SBA) also offers sellers a great deal of information on marketing to the government, including online courses that explain how to do it. The existence of the GSA doesn’t mean the agencies it works with don’t have any say over what is purchased for them. The agencies themselves have a big say, so B2B sellers need to contact them and aggressively market their products to them. After all, agencies don’t buy products, people do. Fortunately, every agency posts on the Internet a forecast of its budget, that is, what it is planning on spending money on in the coming months. The agencies even list the names, addresses, and e-mails of contact persons responsible for purchasing decisions. Many federal agencies are able to purchase as much as $25,000 of products at a time by simply using a government credit card. This fact makes them a good target for small businesses. It’s not unusual for each agency or department to have its own procurement policies that must be followed. 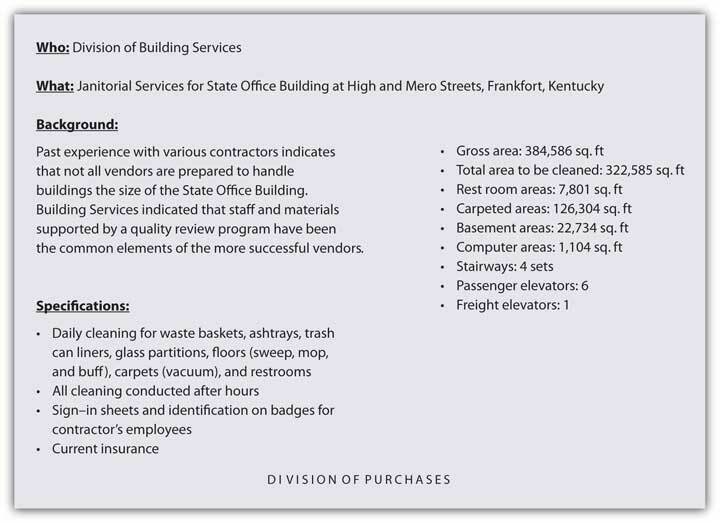 Would-be sellers are often asked to submit sealed bids that contain the details of what they are willing to provide the government and at what price. But contrary to popular belief, it’s not always the lowest bid that’s accepted. Would the United States want to send its soldiers to war in the cheapest planes and tanks, bearing the lowest-cost armor? Probably not. Like other buyers, government buyers look for the best value. Politics can come into play when it comes to large government purchases: Although the F-22 is the most sophisticated fighter jet in the world, it has never been used in battle. 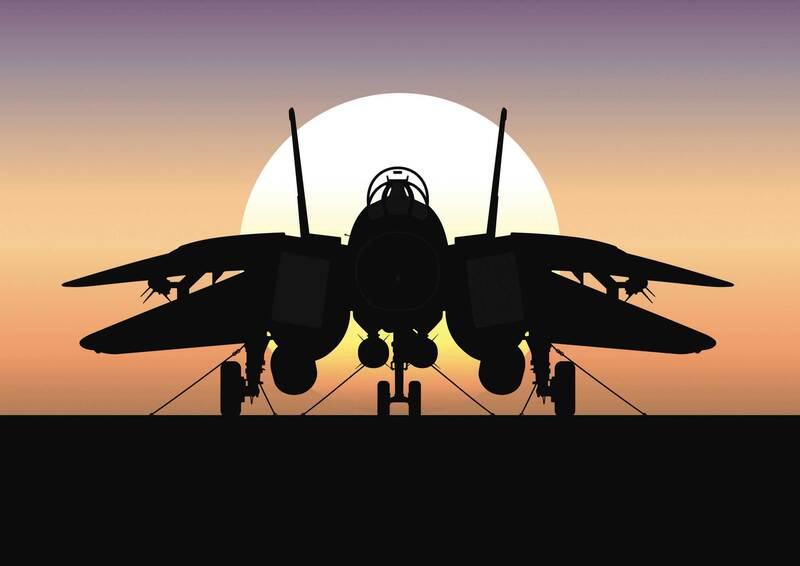 But when the Pentagon wanted to stop production on seven of the jets so it could spend the money on other conventional weapons being used in the wars the United States is currently fighting, it had a fight on its hands from the members of Congress. They didn’t want the companies in their states that helped produce the plane to lose business. Institutional marketsNonprofit organizations such as the American Red Cross, churches, hospitals, charitable organizations, private colleges, and civic clubs. include nonprofit organizations such as the American Red Cross, churches, hospitals, charitable organizations, private colleges, civic clubs, and so on. Like government and for-profit organizations, they buy a huge quantity of products and services. Holding costs down is especially important to them. The lower their costs are, the more people they can provide their services to. The businesses and products we have mentioned so far are broad generalizations to help you think about the various markets in which products can be sold. In addition, not all products a company buys are high dollar or complex. Businesses buy huge quantities of inexpensive products, too. McDonald’s, for example, buys a lot of toilet paper, napkins, bags, employee uniforms, and so forth. Pretty much any product you and I use is probably used for one or more business purposes (cell phones and cell-phone services, various types of food products, office supplies, and so on). Some of us own real estate, and so do many businesses. But very few of us own many of the other products businesses sell to one another: cranes, raw materials such as steel, fiber-optic cables, and so forth. That said, a smart B2B marketer will look at all the markets we have mentioned, to see if they represent potential opportunities. The Red Cross will have no use for a fighter jet, of course. However, a company that manufactures toilet paper might be able to market it to both the Red Cross and the U.S. government. B2B opportunities abroad and online B2B markets can also be successfully pursued. We will discuss these topics later in the chapter. Who Makes the Purchasing Decisions in Business Markets? Figuring out who exactly in B2B markets is responsible for what gets purchased and when often requires some detective work for marketing professionals and the salespeople they work with. Think about the college textbooks you buy. Who decides which ones ultimately are purchased by the students at your school? Do publishers send you e-mails about certain books they want you to buy? Do you see ads for different types of chemistry or marketing books in your school newspaper or on TV? Generally, you do not. The reason is that even though you buy the books, the publishers know that professors ultimately decide which textbooks are going to be used in the classroom. Consequently, B2B sellers largely concentrate their efforts on those people. Who ya gonna call? Click on http://blogs.bnet.com/salesmachine/?p=2308&page=1&tag =col1;post-2308 to play an online game that will help you understand why finding the right decision makers in a company is so tricky. Are you up to the challenge? That’s not to say that to some extent the publishers don’t target you. They may offer you a good deal by packaging a study guide with your textbook or some sort of learning supplement online you can purchase. They might also offer your bookstore manager a discount for buying a certain number of textbooks. However, a publishing company that focused on selling its textbooks directly to you or to a bookstore manager would go out of business. They know the true revenue generators are professors. The question is, which professors? Some professors choose their own books. Adjunct professors often don’t have a choice—their books are chosen by a course coordinator or the dean or chair of the department. Still other decisions are made by groups of professors, some of whom have more say over the final decision than others. Are you getting the picture? Figuring out where to start in B2B sales can be a little bit like a scavenger hunt. Business buyers can be either nonprofit or for-profit businesses. There are four basic categories of business buyers: producers, resellers, governments, and institutions. Producers are companies that purchase goods and services that they transform into other products. They include both manufacturers and service providers. Resellers are companies that sell goods and services produced by other firms without materially changing them. They include wholesalers, brokers, and retailers. Local, state, and national governments purchase large quantities of goods and services. Institutional markets include nonprofit organizations such as the American Red Cross, churches, hospitals, charitable organizations, private colleges, civic clubs, and so on. Holding costs down is especially important to them because it enables them to provide their services to more people. Figuring out who exactly in B2B markets is responsible for what gets purchased and when often requires some detective work by marketing professionals and the salespeople they work with. What sorts of products do producers buy? What role do resellers play in B2B markets, and why are they important to sellers? How do sellers find government buyers? Institutional buyers? Why is it difficult to figure out whom to call on in business markets? Explain what a buying center is. Explain who the members of buying centers are and describe their roles. Describe the duties of professional buyers. Describe the personal and interpersonal dynamics that affect the decisions buying centers make. The professors who form a committee at your school to choose textbooks are acting like a buying center. Buying centersGroups of people within organizations who make purchasing decisions. are groups of people within organizations who make purchasing decisions. Large organizations often have permanent departments that consist of the people who, in a sense, shop for a living. They are professional buyers, in other words. Their titles vary. In some companies, they are simply referred to as buyers. In other companies, they are referred to as purchasing agents, purchasing managers, or procurement officers. Retailers often refer to their buyers as merchandisers. Most of the people who do these jobs have bachelor’s of science degrees. Some undergo additional industry training to obtain an advanced purchasing certification designation.U.S. Bureau of Labor Statistics, “Purchasing Managers, Buyers, and Purchasing Agents,” Occupational Outlook Handbook, 2010–11 ed., December 17, 2009, http://www.bls.gov/oco/ocos023.htm (accessed January 8, 2010). Buyers can have a large impact on the expenses, sales, and profits of a company. Pier 1’s purchasing agents literally comb the entire world looking for products the company’s customers want most. What happens if the products the purchasing agents pick don’t sell? Pier 1’s sales fall, and people get fired. This doesn’t happen in B2C markets. If you pick out the wrong comforter for your bed, you don’t get fired. Your bedroom just looks crummy. Consequently, professional buyers are shrewd. They have to be because their jobs depend on it. Their jobs depend on their choosing the best products at the best prices from the best vendors. Professional buyers are also well informed and less likely to buy a product on a whim than consumers. The sidebar below outlines the tasks professional buyers generally perform. Increasingly, purchasing managers have become responsible for buying not only products but also functions their firms want to outsource. The functions aren’t limited to manufacturing. They also include product innovation and design services, customer service and order fulfillment services, and information technology and networking services to name a few. Purchasing agents responsible for finding offshore providers of goods and services often take trips abroad to inspect the facilities of the providers and get a better sense of their capabilities. UsersThe people and groups within the organization that actually use the product. are the people and groups within the organization that actually use the product. Frequently, they initiated the purchase in the first place in an effort to improve what they produce or how they produce it. Users often have certain specifications in mind for products and how they want them to perform. An example of a user might be a professor at your school who wants to adopt an electronic book and integrate it into his or her online course. InfluencersPeople who may or may not use the product but actively participate in the purchasing process in order to secure a decision they consider favorable. are people who may or may not use the product but have experience or expertise that can help improve the buying decision. For example, an engineer may prefer a certain vendor’s product platform and try to persuade others that it is the best choice. If you want to sell a product to a large company like Walmart, you can’t just walk in the door of its corporate headquarters and demand to see a purchasing agent. You will first have to get past of a number of gatekeepersPeople who decide if and when a salesperson gets access to members of the buying center., or people who will decide if and when you get access to members of the buying center. These are people such as buying assistants, personal assistants, and other individuals who have some say about which sellers are able to get a foot in the door. Warning: Do not be rude to or otherwise anger the faculty secretary. This is good advice for salespeople and students as well as faculty members. Gatekeepers often need to be courted as hard as prospective buyers do. They generally have a lot of information about what’s going on behind the scenes and a certain amount of informal power. If they like you, you’re in a good position as a seller. If they don’t, your job is going to be much harder. In the case of textbook sales, the gatekeepers are often faculty secretaries. They know in advance which instructors will be teaching which courses and the types of books they will need. It is not uncommon for faculty secretaries to screen the calls of textbook sales representatives. The deciderThe person who makes the final purchasing decision. is the person who makes the final purchasing decision. The decider might or might not be the purchasing manager. Purchasing managers are generally solely responsible for deciding upon routine purchases and small purchases. However, the decision to purchase a large, expensive product that will have a major impact on a company is likely to be made by or with the help of other people in the organization, perhaps even the CEO. Sellers, of course, pay special attention to what deciders want. “Who makes the buying decision?” is a key question B2B sales and marketing personnel are trained to quickly ask potential customers. We made it a point earlier in our discussion to explain how rational and calculating business buyers are. So would it surprise you to learn that sometimes the dynamics that surround B2B marketing don’t lead to the best purchasing decisions? Interpersonal factors among the people making the buying decision often have an impact on the products chosen, good or bad. (You can think of this phenomenon as “office politics.”) For example, one person in a buying unit might wield a lot of power and greatly influence the purchasing decision. However, other people in the unit might resent the power he or she wields and insist on a different offering, even if doesn’t best meet the organization’s needs. Savvy B2B marketers are aware of these dynamics and try their best to influence the outcome. Personal factors play a part. B2B buyers are overwhelmed with choices, features, benefits, information, data, and metrics. They often have to interview dozens of potential vendors and ask them hundreds of questions. No matter how disciplined they are in their buying procedures, they will often find a way to simplify their decision making either consciously or subconsciously.Jon Miller, “Why B2B Branding Matters in B2B Marketing,” Marketo.com, March 18, 2007, http://blog.marketo.com/blog/2007/03/b2b_branding_wh.html (accessed December 13, 2009). For example, a buyer deciding upon multiple vendors running neck and neck might decide to simply choose the vendor whose sales representative he likes the most. Factors such as these can be difficult for a company to control. However, branding—how successful a company is at marketing its brands—is a factor under a company’s control, says Kevin Randall of Movéo Integrated Branding, an Illinois-based marketing-consulting firm. Sellers can use their brands to their advantage to help business buyers come to the conclusion that their products are the best choice. IBM, for example, has long had a strong brand name when it comes to business products. The company’s reputation was so solid that for years the catchphrase “Nobody ever got fired for buying IBM” was often repeated among purchasing agents—and by IBM salespeople of course!Jon Miller, “Why B2B Branding Matters in B2B Marketing,” Marketo.com, March 18, 2007, http://blog.marketo.com/blog/2007/03/b2b_branding_wh.html (accessed December 13, 2009). In short, B2B marketing is very strategic. Selling firms try to gather as much information about their customers as they can and use that information to their advantage. As an analogy, imagine if you were interested in asking out someone you had seen on campus. Sure, you could simply try to show up at a party or somewhere on campus in the hopes of meeting the person. But if you were thinking strategically, you might try to find out everything you could about the person, what he or she likes to do and so forth, and then try to arrange a meeting. That way when you did meet the person, you would be better able to strike up a conversation and develop a relationship with him or her. B2B selling is similarly strategic. Little is left to chance. Buying centers are groups of people within organizations who make purchasing decisions. The buying centers of large organizations employ professional buyers who, in a sense, shop for a living. They don’t make all the buying decisions in their companies, though. The other people who provide input are users, or the people and groups within the organization that actually use the product; influencers, or people who may or may not use the product but have experience or expertise that can help improve the buying decision; gatekeepers, or people who will decide if and when a seller gets access to members of the buying center; and deciders, or the people who make the final purchasing decision. Interpersonal dynamics between the people in a buying center will affect the choices the center makes. Personal factors, such as how likeable a seller is, play a part because buyers are often overwhelmed with information and will find ways to simplify their decision making. Which people do you think have the most influence on the decisions a buying center makes? Why? Describe the duties of professional buyers. What aspects of their jobs seem attractive? Which aspects seem unattractive to you? How do personal and interpersonal dynamics affect the decisions buying centers make? A modified rebuyWhen a company wants to buy the same type of product it has in the past but make some modifications to it. occurs when a company wants to buy the same type of product it has in the past but make some modifications to it. Maybe the buyer wants different quantities, packaging, or delivery, or the product customized slightly differently. For example, your instructor might have initially adopted this textbook “as is” from its publisher, Flat World Knowledge, but then decided to customize it later with additional questions, problems, or content that he or she created or that was available from Flat World Knowledge. Describe the reasons why firms in the same industries are often located in the same geographic areas. Explain the effect e-commerce is having on the firms, the companies they do business with, where they are located, and the prices they charge. Outline the different types of e-commerce sites and what each type of site is used for. Another characteristic of B2B markets that you may or may not have noticed or thought about is that firms in the same industry tend to cluster in the same geographic areas. In the United States, many banks and financial companies are located on or near Wall Street in New York City. Many film and television companies operate out of Hollywood. Is it just by chance that this has occurred? No. The clustering occurs because the resources these firms need—both human and natural—are located in some areas and not others. For example, the Gulf of Mexico is rich with oil deposits. As a result, many oil companies and facilities are located along or near the Gulf in cities such as Houston. Likewise, many high-tech companies are located in Silicon Valley (California). One reason is that nearby Stanford University is one of the top computer-science schools in the country, and the firms want to hire graduates from the school. Bollywood, which refers to the film industry in India, has become one of the largest film centers in the world. It’s growing faster than Hollywood and is beginning to rival its size. But that’s not the only reason businesses in the same industry cluster together. Another reason is the sellers want to be close to their buyers. Bentonville, Arkansas, the world headquarters of Walmart, used to be a sleepy little rural town. As Walmart grew, so have the number of companies moving into the area to do business with Walmart. In the last twenty years, the size of the town has nearly tripled. Why do companies want to be near their buyers? Let’s go back to our date analogy. Suppose you hit it off with the person you’re interested in and you become “an item.” You probably wouldn’t want to be half the world away from the person for a long period of time because you would miss the person and because you wouldn’t want a rival moving in on your turf! Companies also want to be close to their suppliers because it can help them get inventory more quickly. Dell’s suppliers are located right next to the company’s assembly plants. And, as you have learned, some companies actually locate their personnel on their customers’ sites. Not all B2B buyers and sellers are cozying up to one another location-wise today, though: e-commerceCommerce conducted electronically, such as over the Internet., or commerce conducted electronically, such as over the Internet, has made locating near buyers less important. Consider the Hubert Company, a Cincinnati-based firm that sells supplies to the food industry. 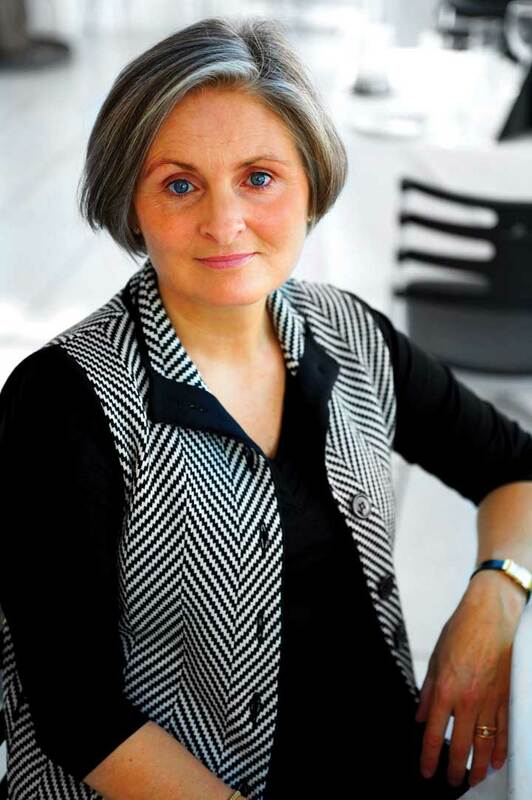 “Just ten years ago the Internet didn’t exist for the Hubert Company, and today almost 30 percent of our business comes through the Internet as an ordering mechanism,” says Bart Kohler, president of the company.Information from Bart Kohler based on a telephone interview conducted by Dr. Camille Schuster. However, the Hubert Company can no longer protect the market in and around Cincinnati just because it’s headquartered there. “Whereas in the past, I was somewhat insulated to just people in my area, now there really are no geographic boundaries anymore, and anyone can compete with me anywhere,” Kohler explains. The advantage is that whereas the United States is a mature market in which growth is limited, other countries, like Brazil, India, and China, are growing like crazy and represent huge opportunities for the Hubert Company, he says. The Hubert Company sells to companies all over the globe, including the U.S. government. Notice the GSA link in the upper right-hand corner of its Web page. Things have changed. Companies have since developed sophisticated e-commerce systems that allow their customers to do many things for themselves. As a result, they have been able to cut down on the amount of customer service they need to provide. Does your business want to ship your products cheaply across the country via rail? You can sign up online for an account with a railroad like Union Pacific (UP), reserve some rail cars on UP’s site, and choose the route you want them to travel. Later, after you ship the goods, you can check your account balance on the Web site and track the rail cars online like you can packages shipped with FedEx and UPS. The office supply chain Staples has special Web sites set up for each of its business customers, which are customized with online catalogs containing the types of products they buy at the prices they seem to be willing to pay, based on their past purchases on StaplesLink.com.Efraim Turban, Jae K. Lee, David King, Ting Peng Liang, and Deborrah Turban, Electronic Commerce 2010, 6th ed. (Upper Saddle River, NJ: Prentice Hall, 2009), 203. Today’s B2B sites are far from static. Most of the examples we’ve described so far are examples of sell-side e-commerce sites. A sell-side siteA Web site in which a single seller sells products to many different buyers. is a site in which a single seller sells products to many different buyers. 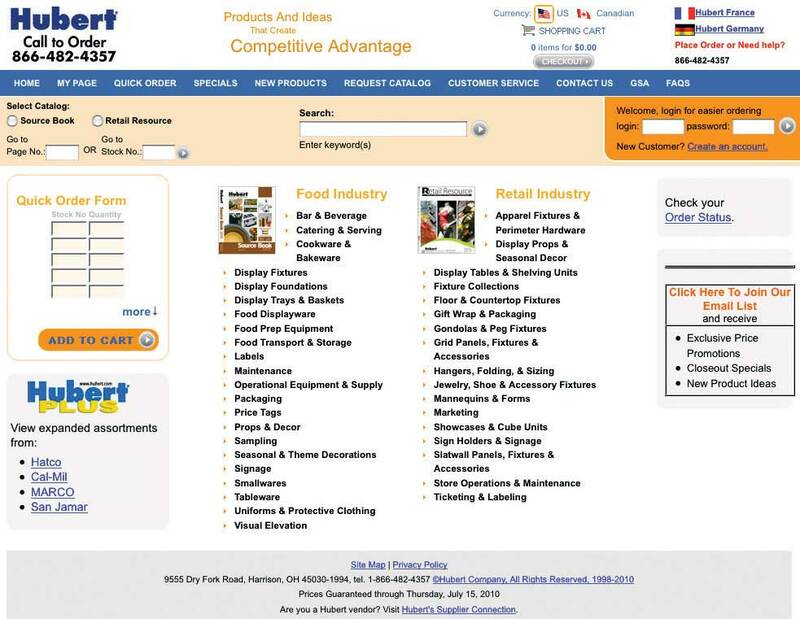 Figure 4.10 "An Example of a Sell-Side B2B Web site" shows the direction of the sale of goods and services sold on a sell-side site, such as the Hubert Company has. Need chemicals? 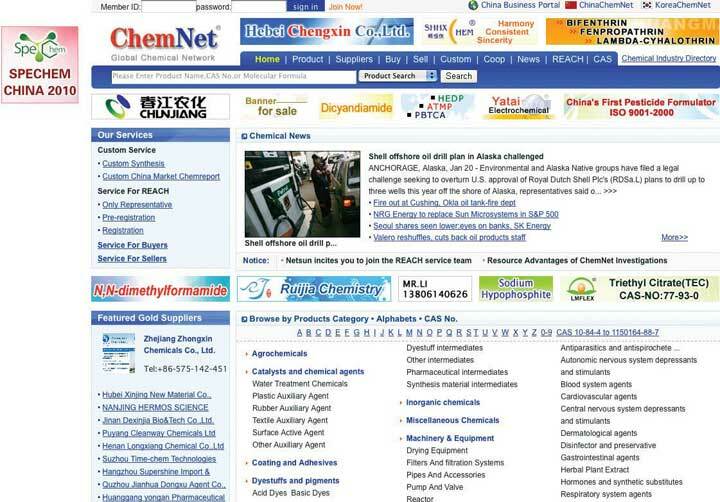 You can find them on the B2B exchange Web site ChemNet. B2B auctionsWeb-based auctions that occur between businesses. are Web-based auctions that occur between businesses. The auctions can be either sell side or buy side. An example of a sell-side auction is a B2B auction that occurs on eBay or a site like AssetAuctions.com where surplus industrial equipment is sold. Motorola regularly sells small quantities of products at the end of their life cycles on eBay. Motorola has found that eBay is a good way to make some money from products that businesses are reluctant to buy otherwise because they are being discontinued.“Motorola Finds Higher Return in B2B Auctions on eBay,” internetretailer.com, March 23, 2002, http://www.internetretailer.com/dailyNews.asp?id=8291 (accessed December 13, 2009). Sell-side auctions are sometimes referred to as forward auctions. Buy-side auctions, by contrast, reverse the traditional auction formula, which is to help the seller get the highest price for the product. Instead, the buyer initiates the auction in order to find the cheapest supplier of a product. Sellers then bid against one another, offering the lowest prices they can for their products, in order to get the buyer’s business. Because the roles of the buyers and sellers are reversed in buy-side auctions, they are often referred to as reverse auctionsWhen the buyer lists what he or she wants to buy and also states how much he or she is willing to pay. The reverse auction is finished when at least one firm is willing to accept the buyer’s price..
Not all companies use an intermediary like eBay or AssetAuctions to conduct their auctions, though. Some companies conduct their own auctions on their Web sites so they don’t have to pay a fee to an intermediary. For example, General Motors auctions off reconditioned vehicles to auto dealers on its own Web site, http://www.gmonlineauctions.com. One of the consequences of e-commerce is that B2B customers can easily shop around from the convenience of their cubicles or offices, bid on products, and read blogs about products from industry experts. That’s what buyers generally do before they get on the phone or personally meet with sellers. E-commerce has made it especially easy for buyers to compare prices. And the cheapest price often attracts the most attention. To avoid e-commerce price wars, some companies refuse to sell their products directly online or put prices on them. Snapper products are an example. Go to Snapper.com, and you will find a lot of information about Snapper mowers and snow blowers online and dealers where you can buy them. But you won’t see any prices listed. Nor can you buy a product directly from the Web site. Firms in the same industry tend to cluster in the same geographic areas because the resources these firms need—both human and natural—are located in some areas and not others. Sellers also want to be close to their buyers. E-commerce, or commerce conducted electronically such as over the Internet, has made locating near buyers less important for business-to-business sellers and opened up opportunities for them to sell their products around the world. However, e-commerce has also led to more competition and made it difficult for sellers to raise their prices. B2B e-commerce was slower to take hold than B2C e-commerce. Companies have since developed sophisticated e-commerce systems, including sell-side and buy-side Web sites, exchanges, and B2B auctions. Name some other industries you’re aware of in which companies tend to cluster geographically. Why are the companies in these industries located near one another? How do B2B exchange sites differ from B2B auction sites? How can firms that sell their products on the Internet prevent their prices from being driven down by competitors? It’s likely that every topic we have talked about so far in this chapter has an ethical dimension to it. Take procurement, for example: unlike B2C markets, offering customers free dinners, golf games, and so forth is very common in B2B settings. In many foreign countries, business and government buyers not only expect perks such as these but also actually demand bribes be paid if you want to do business with them. And firms pay them, even though some countries prohibit them. (The United States is one such country.) Which countries have a penchant for bribery? In a report called the “Bribe Payers Index,” Transparency International, a watchdog organization, annually ranks the likelihood of firms from the world’s industrialized countries to bribe abroad. The top five countries are shown in Table 4.3 "Transparency International’s Bribe Payers Index, 2008". Or take, for example, the straight-rebuy situation we discussed earlier. Recall that in a straight rebuy, buyers repurchase products automatically. Recently, Dean Foods, which manufactures the Silk brand of soy milk, experienced a lot of negative press after the company changed the word “organic” to “natural” on the labels of its milk, and quietly switched to conventional soybeans, which are often grown with pesticides. But Dean didn’t change the barcode for the product, the packaging of the product, or the price much. So stores kept ordering what they thought was the same product—making a straight rebuy—but it wasn’t. Many stores and consumers felt as though they had been duped. Some grocers dropped the entire Silk lineup of products.Richard Waters and Nikki Tait, “Intel Settles Antitrust AMD Case for $1.2 Billion,” Financial Times, November 13, 2009, http://www.ft.com/cms/s/0/789729c2-cff4-11de-a36d-00144feabdc0.html (accessed December 13, 2009). 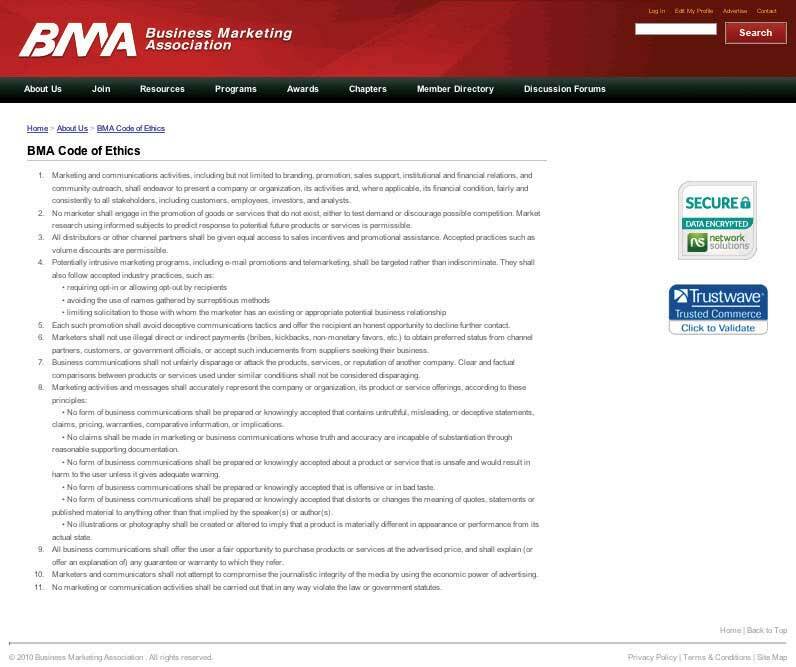 Click on the following link to read the Business Marketing Association’s entire code of ethics: http://www.marketing.org/i4a/pages/Index.cfm?pageID=3286. All things equal, companies want to do business with firms that are responsible. They don’t want to be associated with firms that are not. Why is this important? Because that’s what consumers are increasingly demanding. A few years ago, Nike and a number of other apparel makers were lambasted when it came to light that the factories they contracted with were using child labor and keeping workers toiling for long hours under terrible conditions. Nike didn’t own the factories, but it still got a bad rap. Today, Nike, Inc., uses a “balanced scorecard.” When evaluating suppliers, it looks at their labor-code compliance along with measures such as price, quality, and delivery time. During crunch times, it allows some Chinese factories latitude by, for example, permitting them to adjust when employees can take days off.Dexter Roberts, Pete Engardio, Aaron Bernstein, Stanley Holmes, and Xiang Ji, “How to Make Factories Play Fair,” BusinessWeek, November 27, 2006, http://www.businessweek.com/magazine/content/06_48/b4011006.htm (accessed December 13, 2009). Similarly, Walmart has developed a scorecard to rate its suppliers on how their packaging of products affects the environment.Mark Arzoumanian, “Wal-Mart Updates Scorecard Status,” Official Board Markets 84, no. 46 (November 15, 2008): 1, 4. Walmart does so because its customers are becoming more conscious of environmental damage and see value in products that are produced in as environmentally friendly a way as possible.